We sit down with self-taught amateur and season 4 winner of History Channel's Top Shot and now professional shooter sponsored by Bass Pro Shops…Chris Cheng! 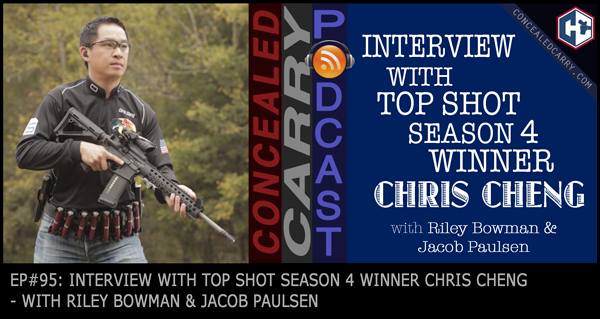 Chris goes over how he started in the shooting sports, what inspired him to take it to the next level, what it was like competing with the kind of stress one experiences in a competition like Top Shot, all while making all kinds of relevant connections to what it means for everyday gun owners and CCWers. Trust me, you don't wanna miss this interview! Chris Cheng is also going to be our special guest for this month's Guardian Nation Live Broadcast…don't miss it on February 16th, 2017 at 7:00 pm MST. But you've got to be a part of Guardian Nation to participate, so check it out below! Gerald, the issue with this podcast episode was resolved. Should be good now. I can’t find the link to the training camp Chris is holding, do you have that?